Israel forms a land bridge between the Mediterranean Sea on the west and the Gulf of Aqaba/Red Sea on the south.Israel’s Mediterranean coastline is 190 km long; territorial waters extend to 12 nautical miles but the State has extensive exploitation rights of marine resources beyond that limit. Israel's coastline in the Gulf of Aqaba is 14 km long with territorial waters extending eastward to the middle of the Gulf and in the south to the Egyptian border. Israel's marine and coastal resources are among the country's most valuable natural assets and are of great importance for its economic development and the well being of its inhabitants. These resources are subjected to the impacts of diverse human activities and are also affected by natural, regional and global environmental changes. 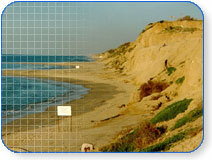 This section of the web site presents articles, technical reports and reviews by IOLR scientists about Israel's marine and coastal environment, information on selected relevant research projects of IOLR and links to some relevant sites on the World Wide Web.